Williams Lake, B.C. 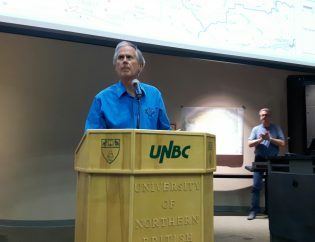 – Some encouraging news in the South Cariboo as the Cariboo Regional District has started work on a re-entry plan for evacuated residents in the 100 Mile House area. “The plan has a number of pieces to it,” says chair Al Richmond. “We have to get the hospital open, we have to get supermarkets open and we have to check out all the infrastructure,” he tells 250News. Richmond adds notifying grocery store owners of a possible re-entry would be part of the plan along with checking to ensure key infrastructure is restored and safe (BC Hydro, Telus, Fortis BC). He says the progress BC Wildfire Service crews have made on the Gustafsen fire west of town has made the planning possible. Richmond cautions however that people shouldn’t be getting their hopes up that they’ll be going home tomorrow.